The following article has been provided by Barlow Bob, founder & organizer of the NEAF Solar Star Party and regional event host & lecturer. You can read more about Barlow Bob and see some of his other articles at www.neafsolar.com/barlowbob.html. For many years, amateur solar astronomy icon Alan Daroff has attended the solar observing at NEAF, the Northeast Astronomy Forum. He is the senior member of our NSSP NEAF Solar Star Party solar staff. Using a prism spectroscope, he demonstrated how the parts of a modern hydrogen-alpha solar filter create a breathtaking image of the Sun. He placed the H-alpha Fabry – Pérot etalon, plus blocker and trimmer filter parts, in front of the spectroscope slit. When sunlight passes through these instruments, you observe the red H-alpha spectral line at 656.28 nanometers. At NSSP, I use the Lhires Lite high resolution grating spectroscope to recreate Alan’s impressive demonstration. The Lhires Lite spectroscope produces an unforgettable image of the solar spectra. This new product is manufactured by Shelyak Instruments, a French NEAF exhibitor. It was designed as a simple user-friendly educational resource to demonstrate spectroscopy. By moving a side lever, you can observe different parts of the spectrum through an eyepiece. 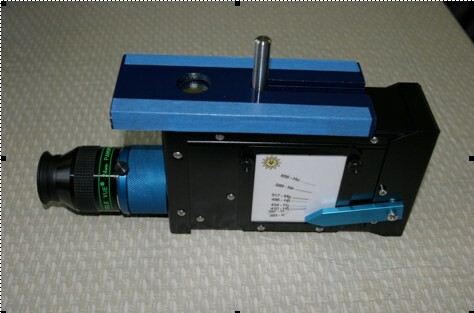 The instrument can be used to observe the bright emission spectra of street lights or Geisler spectrum tubes containing different elements in their gaseous state. The dark absorption spectra of the Sun can also be observed. You would have to use the more sophisticated Lhires III high resolution spectrograph to observe and image the absorption spectra of the other stars. The Lhires Lite has a 1/2” round short metal rod attached to the top near the slit that passes light into the device. The rod is called a gnomon. The gnomon is used to align the slit with the Sun to ensure that sunlight enters the spectroscope. To align a Lhires Lite spectroscope on a photographic tripod with the Sun, you move the spectroscope until the gnomon faces the Sun. Then you move the spectroscope until the gnomon’s shadow disappears and the sunlight is passing through the slit into the spectroscope. When sunlight reflects off of the holographic grating, it is separated into the colors of the electromagnetic spectrum. When you observe the spectra of an incandescent light bulb, you see a rainbow of colors, from red to violet. However, when you observe the solar spectra of sunlight, you see the same rainbow of colors, with hundreds of thin vertical dark lines covering every color. 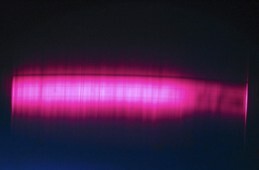 These dark lines are the Fraunhoffer absorption spectral lines of the solar spectra, created when elements in the stellar atmosphere absorb at specific wavelengths. These Fraunhoffer lines are the fingerprints of stars, used by astronomers to analyze the physical properties of stars and other celestial objects. Instead of holding the parts of the H-alpha etalon parts in front of the spectroscope slit with my hand, I use a holder that I designed to position the filter parts over the slit. The holder consists of three parts. Each part is a 2 ½ X 7” rectangular shaped piece of Masonite. A four inch long notch slightly wider than the width of the gnomon notch is cut into the center of the left side of the holder. A hole is drilled into the right side, centered to hold the filter part in position over the spectroscope slit. The middle part has a hole, slightly larger than the diameter of a filter part. The top and bottom parts have a hole, smaller than the middle part. The middle holder part is placed over the bottom holder part. Blue painter’s masking tape is placed over the right and left edges. A filter is placed in the middle hole. The top holder part is placed over the middle holder part. Masking tape is placed over the right and left edges and folded over covering the three holder parts. When the three filter holder parts are held together, the filter will be securely held in place between the holder parts. This prevents damage to the filter. When viewed through the Lhires Lite spectroscope, each filter shows a different image. The etalon shows a series of thin bright H-alpha red lines separated by thin black lines, similar to a picket fence. The Fabry – Pérot etalon creates peaks and valleys of only the bright red Hydrogen – alpha electromagnetic wavelengths. This etalon consists of two pieces of flat glass separated by mica. The glass is spaced a specific and exacting distance apart. 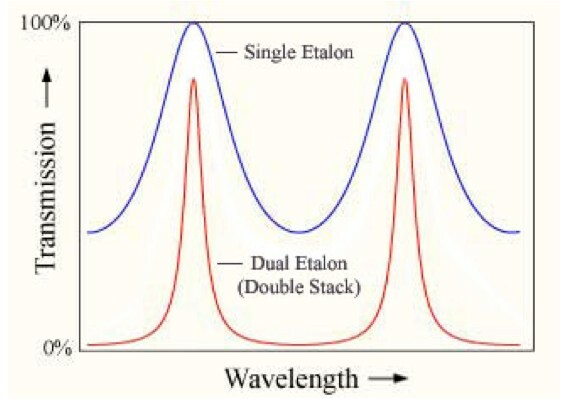 When light passes through the etalon, only the wavelengths of the red H-alpha spectral line that fits between the two glass surfaces pass through. When you observe red solar prominences through an H-alpha solar filter, you observe only the bright peaks of this red wavelength. At the 2014 NSSP – NEAF Solar Star Party, I asked WAA President Larry Faltz to place his digital point-and-shoot camera over the spectroscope’s TeleVue 24 mm Panoptic eyepiece to record the image produced by three different filters through the Lhires Lite high resolution spectroscope. Blue peaks and black valleys of a CaK Calcium Etalon filter. An H-alpha blocker filter. This blocks the wavelengths of light above and below the dark Hydrogen-Alpha absorption spectra line. This dark line is visible at the top of the red color. 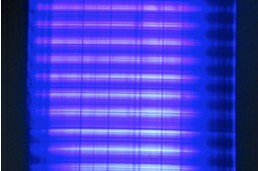 The blocker and trimmer filter parts allow only the wavelength of the red H-alpha spectra line to pass, blocking the other lines. 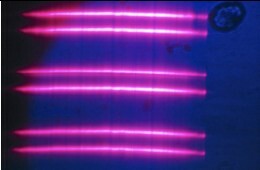 You see the dark Fraunhoffer absorption line with only thin lines of bright red color on either side of this dark line, or no color over large areas. Please attend NEAF and experience this unique educational spectroscopy demonstration at NSSP. The Fabry-Pérot etalon consists of a transparent plate with two dielectrically-coated reflecting surfaces. It uses the principle of interference between the multiple reflections of light between the two reflecting surfaces to convert the uniform light output of the Sun to a series of peaks and troughs looking somewhat like a sinusoidal “picket fence,” as shown in the blue curve in the illustration (illustration not to scale). Constructive interference occurs if the transmitted beams are in phase, and results in a high-transmission peak. If the transmitted beams are out-of-phase, destructive interference occurs. This results in a transmission minimum. Modern hydrogen alpha telescopes use blocker filters to eliminate the peaks outside of the desired 656.28 nm wavelength. Two etalons in tandem can narrow the width of the peak, increasing sharpness and contrast. This entry was posted in Articles, Equipment. Bookmark the permalink.